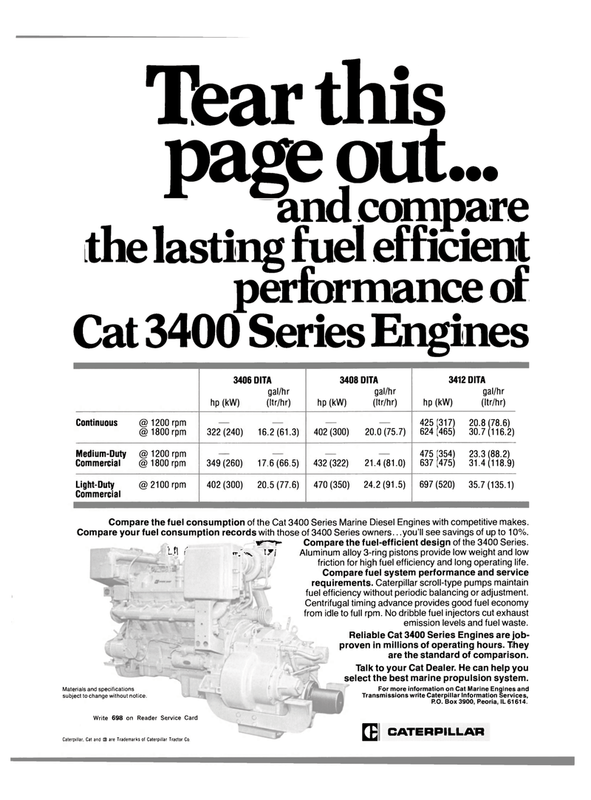 Compare the fuel consumption of the Cat 3400 Series Marine Diesel Engines with competitive makes. Caterpillar, Cat and E are Trademarks of Caterpillar Tractor Co, friction for high fuel efficiency and long operating life. Compare fuel system performance and service requirements. Caterpillar scroll-type pumps maintain fuel efficiency without periodic balancing or adjustment. Centrifugal timing advance provides good fuel economy from idle to full rpm. No dribble fuel injectors cut exhaust emission levels and fuel waste. Reliable Cat 3400 Series Engines are job- proven in millions of operating hours. They are the standard of comparison. Talk to your Cat Dealer. He can help you select the best marine propulsion system.